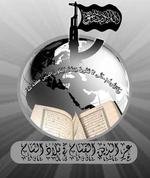 Harakat Sham al-Islam is a group set up by Moroccan ex-Gitmo detainee Ibrahim bin Shakaran dating back to at least the summer of 2013. Primarily recruiting Moroccan foreign fighters, it has also taken up foreign fighters of other nationalities and has a native Syrian contingent. It is primarily based in Latakia but has also operated in Aleppo province. The so-called Izz ad-Din al-Qassam division (not linked to Hamas) has operated in Latakia and participated in a rebel offensive in mid-March 2014 that led to the capture of the Armenian Christian town of Kassab, though the offensive was completely reversed by June, with Ibrahim bin Shakaran killed in the fighting. The group also featured ex-Gitmo detainee Muhammad al-'Alami, killed in summer 2013 in Latakia, and still living ex-Gitmo detainee Muhammad Mizouz. Ideologically, the group shares al-Qaeda's goals of a global caliphate (as the Izz ad-Din al-Qassam logo should make clear), and tried to maintain good relations with Jabhat al-Nusra and the Islamic State, though in practice it has been closer to the former. The group has subsequently denounced the Islamic State. While it would not have been inaccurate to call Harakat Sham al-Islam a front project for al-Qaeda, the death of Ibrahim bin Shakaran appeared to have shifted the dynamics somewhat, as the group has still not subsumed itself under Jabhat al-Nusra (unlike Suqur al-Izz), but instead joined the Jabhat Ansar al-Din coalition. It is possible that Harakat Sham al-Islam is using Syria as a training ground to send Moroccans back to their home country to wage jihad.